In a world that depends so much upon metal, this is an important field of work to consider. Millions of products are made of metal, from the simple paper clip on up to the complex space shuttle. Welding and metal fabrication are essential to our way of life. This program will enable students to develop the skills necessary to find employment and succeed in the welding and metal working field. 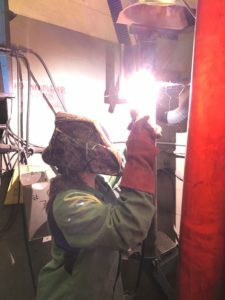 Students will learn to weld sheet metal, plate, and tubing in the flat, horizontal, vertical and overhead positions using the SMAW (Stick-Arc), GMAW (MIG), and GTAW (TIG) processes, on carbon steel, stainless steel, and aluminum. Students will learn to design, plan jobs, read drawings, lay out, fit, plasma and oxy-fuel cut, grind, shear, punch, drill and bend for both class and personal projects. Shop safety, problem-solving, professionalism, teamwork, product quality and work ethic are stressed. This course is held at Sanford Regional Technical Center in room V-16.